I didn't mean for the title to sound as though I've met him (though I'd give just about anything for that to happen). I decided to write this post after a few weeks of DB nonsense bumping around in my head. I want to preface this by saying that I am usually a very level-headed person and never really idolize anyone or anything as much as I do David Bowie. I first discovered him while watching Labyrinth when I was about 13. I liked it, but this was an odd time in my life so I didn't give it a whole lot of thought. One of my oldest friends referenced it several months later (which she had been doing for years and years, but I didn't know it) and I caught the reference and remembered that movie. My parents being the collectors that they are, had the movie. I promptly pulled it out and the rest is history! I watched that movie nearly everyday for a good portion of middle and high school. During this time, I became very interested in the Goblin King. This was my first introduction to David Bowie. My mom got a hold of some CDs for me and I listened to them nonstop (the first three were Let's Dance, Aladdin Sane, and Young American). Not long after that, Reality came out. I continued to collect albums, but even now, I don't have all of them. In high school, the band, orchestra, and choir took a trip to New York. I was in Orlando with my family the week before, so my mom and I flew up separately from the rest of the students to meet them in New York City. Because we missed the bus ride to the hotel, we missed passing by David Bowie's house. I have always regretted that I could not be on that bus. When I was about 17, I met a guy (my dance teacher's brother-in-law, actually) who met David Bowie. That's right, one degree of separation! I'm just a little proud of that. Anyway, we danced together one evening and he was telling me about DB. He said that DB could be a bit of a jerk in person because he never hears anything but how much people love him and his music. Understandably, he gets tired of that. He told me that the best way to approach DB in conversation was to talk about something else. He gave a few examples and told me what he talked about with DB (which I can't remember all theses years later), but I do remember deciding then and there that I wanted to ask DB if he had pets. As an animal lover, I am curious about such things and I have never come across the answer in my readings. Apparently interviewers aren't interested in whether or not he has pets. Despite my being such a huge fan, I haven't seen many of DB's movies. I'm not sure why this is. Part of it is that most of the movies that he is in appeal to me very little (his presence aside). I did watch Arthur and the Invisibles, in which DB voices the bad guy. That one gave me dreams about DB for the first time ever. Because of this, I haven't watched the movie again because I'm afraid it won't work a second time! It was a pretty good one, though. As I got older and read more about DB, I started to feel odd about him. He doesn't seem like the kind of person who would grab and hold me so strongly. Especially as a younger man, I would have hated him if I ever had a chance to meet him. I didn't approve of almost anything that he did or most of the choices he made. He and I are very drastically different people. I don't really understand why he appeals to me so strongly. Except, of course, that I love his music. People have teased me for having a crush on DB. It may surprise you to know that this is not true. He is an attractive man and I think that he has aged well. But my physical attraction extends no further than that. Part of that is because he is the same age as my dad, and that's just creepy. 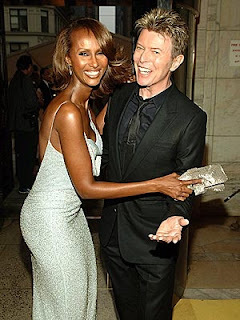 Also, I am a fan of his wife, Iman, and I like that he has always tried to be such a good father. I wouldn't want to interfere with his personal life. I like his personal life the way it is. That sounds silly, but I like what I have read and seen concerning his family. There is absolutely no place for me there. Which is fine, I promise. I like being the adoring fan. What brought all of this to the forefront of my mind was a dream that I had maybe a couple of months ago. I was at a concert, by myself. David Bowie happened to be an audience member at the concert, but towards the end, they called him up and he gave a little performance for us. I stayed around after the concert hall cleared and DB and several fans/friends were hanging out around their seats. Being the fan that I am, I approached with a pen and paper for an autograph. While I waited, I got so nervous and kept thinking about how I was supposed to not just tell him that I loved his music. I got pretty panicky, which made his other fans and friends laugh at me, but I tried to keep my cool. It didn't work at all, and I managed to put my foot in my mouth telling him what a big fan I was. He seemed indifferent. As he signed my paper, I did ask him if he had pets. He seemed a little surprised, but told me that he had two (a dog and a cat, but I can't remember their names, which he also told me). Then I managed to walk away full of excitement and nervous energy while his fans/friends laughed. I flipped them off as I walked away because I felt, at this point, nothing could bring me down. The thing about this dream? That's what would really happen if I ever met him. All of that information and crap would be running around in my head while I made a bumbling mess of myself. But here is the main thing--I idolize him and I have been such a big fan for so long. His music and Labyrinth have had such a big effect on me and my life. How could I not try to convey that to him? His work has meant so very much to me and touched me on levels that I didn't know existed. And while, to him, I would just be another nameless (and maybe crazed) fan, it would mean the world to me to watch him perform and to meet him. Even if he didn't remember me after, I would be so happy. I honestly think that I could die happy if that happened. Which makes me feel a little silly, but that is how much he has impacted my life. So there you have it. I love David Bowie. And I love Labyrinth. DB and Labyrinth, even after all these years, still hold a lot of magic for me. I think that's why I am such a fan. 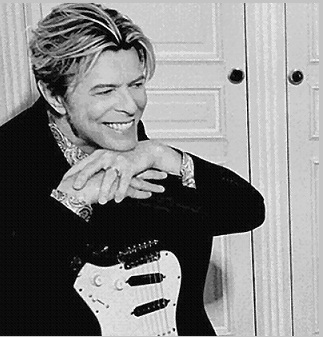 Never mind my differences with younger Mr. Bowie (though he has grown so wise and dignified, I think, I find it easier to forgive his past indiscretions), never mind what anyone else thinks. I am a DB fanatic. And proud. This was a very personal post for me. Most of my friends and family like DB fine, but I have a pretty personal connection to his work which no one that I know personally shares. I promise that I am not so weird about most things in my life (except, perhaps, my pets)... But thank you for reading. I will let you all know if I ever get the chance to stumble my way through meeting my idol.